From early June to January 2014, the author collected find coordinates recorded by locals, research teams and professional meteorite hunters from Russia, Poland, Germany and the US. Until January 13, a total of 296 Chelyabinsk meteorites were reported of which 241 came with the weight of the respective masses. A strewnfield map was produced by the author on the base of map data from the OpenStreetmap project (openstreetmap.org) that is now available in its final version 1.40 (status of January 13, 2014). At the time the first version of the strewnfield map was compiled, K. Wimmer had already completed both, a basic trajectory projection of the Chelyabinsk superbolide and the resulting strewnfield model, which were later re-evaluated and refined. When comparing the data, it was surprising how the calculation of the resulting trajectory and strewnfield area matched the actual field data. Unlike other models circulating at that time, the authors had taken into account the available data for tropospheric wind-velocities and wind-directions and had calculated a dark flight model that reflected the lateral displacement for masses in the range from 1 g to 800 kg. From early June to January 2014, the author collected find coordinates recorded by locals, research teams and professional meteorite hunters from Russia, Poland, Germany and the US. Until January 13, a total of 296 Chelyabinsk meteorites were reported of which 241 came with the weight of the respective masses. A strewnfield map was produced by the author on the base of map data from the OpenStreetmap project (openstreetmap.org) that is now available in its final version 1.40 (status of January 13, 2014). At the time the first version of the strewnfield map was compiled, K. Wimmer had already completed both, a basic trajectory projection of the Chelyabinsk superbolide and the resulting strewnfield model, which were later re-evaluated and refined. When comparing the data, it was surprising how the calculation of the resulting trajectory and strewnfield area matched the actual field data. Unlike other models circulating at that time, the authors had taken into account the available data for tropospheric wind-velocities and wind-directions and had calculated a dark flight model that reflected the lateral displacement for masses in the range from 1 g to 800 kg. The resulting strewnfield center line does not follow a straight axis. The curve shows the lateral displacement of the meteorites from the trajectory. As was to be expected, the majority of the meteorite-find locations show considerable lateral displacement to the north and to the south from the strewnfield center line. This is the effect of transversal velocities resulting from the violent fragmentations that produced the fragments. The wind model was derived from soundings on Feb 15, 2013, 00UTC at stations in Verhnee Dubrovo, Kurgan, Ufa, and Orenburg. Maximum wind was about 20 m/s (38.8 knots) from NW in 9 km altitude; ground wind was low around W. As a result the dark flight simulation yields a net wind shift from NW (313°-316° depending on fragment mass). As can be seen in the curved strewnfield center line, the wind shift-effect is larger for the smallest masses at the beginning of the strewnfield (0.1 -10 g). For a mass of 10 g the calculated wind drift is 7.9 km (linear distance from actual fall location to the calculated fall location without wind drift). With increasing mass the wind shift decreases steadily, and for a meteorite of 10 kg it is already reduced to 2.4 km while for the Chebarkul Lake mass (~ 600 kg) it is only 950 m.
The wind shift discussed above leads to a lateral deflection and therefore to a curved strewn field center line. While the curvature is small in the case of Chelyabinsk, it may be much stronger in other falls and produce anything from a straight line through hockey stick to a horse shoe, depending on fragmentation altitude, wind direction and speed. The resulting strewn fields will virtually never be elliptic, in contrast to the widespread tradition to call them “distribution ellipses”. 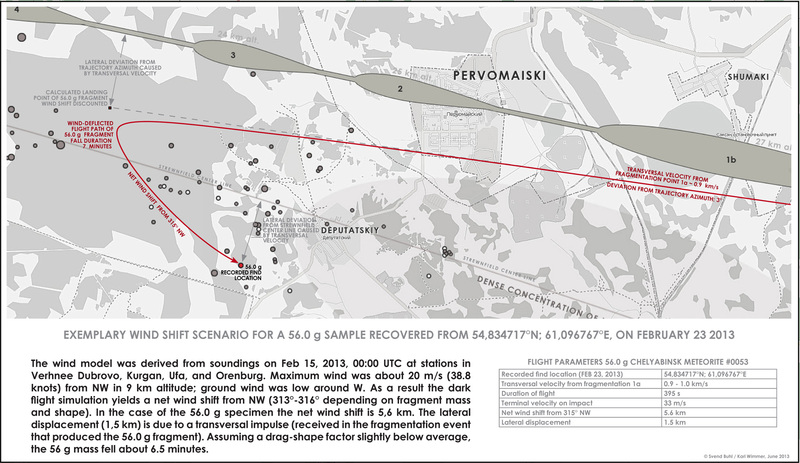 The illustration below shows an exemplary wind shift scenario for the fall of a 56.0 g sample recovered from 54,834717°N; 61,096767°E on February 23, 2013. In the case of the 56.0 g specimen the net wind shift is 5,6 km. The lateral displacement (1,5 km) is due to a transversal impulse (received in the fragmentation event that produced the 56.0 g fragment). Assuming a typical meteorite shape, the 56 g mass fell about 7 minutes. Fragments from a single fragmentation are expected to land along a strewn field center line, with smaller masses staying behind bigger ones due to the deceleration by air drag. The resulting mass sorting, however, is limited, as the air drag is much more dependent on the individual shape of the meteorites than on their masses. 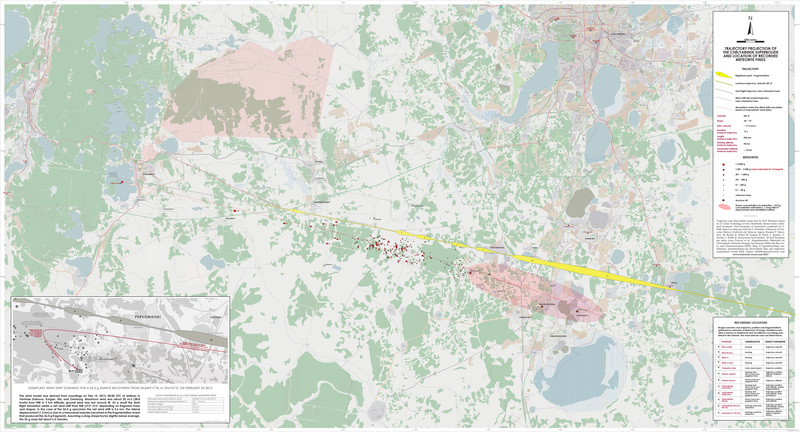 In the case of the Chelyabinsk superbolide the mass sorting is even more suppressed as a series of fragmentations along a path of close to 50 km causes an overlap of sub-strewnfields resulting in an almost chaotic mix of masses, particularly in the central part. Seven major flares or brightness peaks are shown in the trajectory projection. The projection of their respective starting and end points is based on video data recorded from GPS-confirmed locations. While an error margin remains, their position along the trajectory is in good accordance with several meteorite clusters on the ground. Please note that underlying map data is from Openstreetmap.org and licensed under Creative Commons Attribution-ShareAlike 2.0 license (CC-BY-SA) © OpenStreetMap contributors. 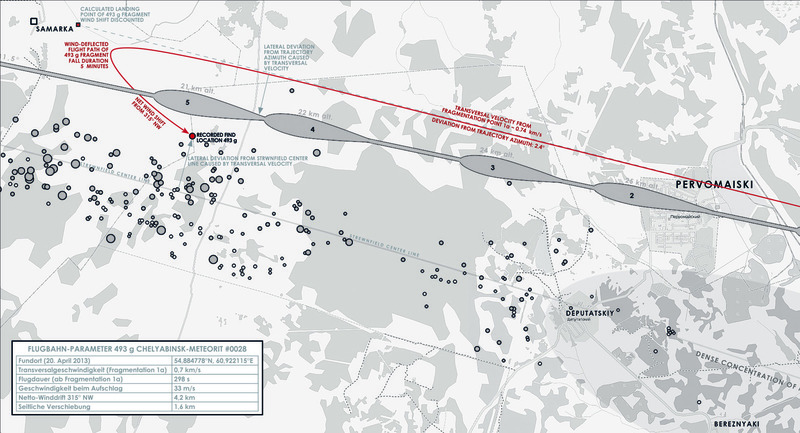 The Chelyabinsk trajectory and strewnfield map was compiled by S. Buhl and K. Wimmer, projection of trajectory and meteorite finds are licenced under Creative Commons Attribution-ShareAlike 2.0 license, which includes attribution of the authors. We encourage a non-comemercial distribution of the Chelyabinsk strewfield map only. We are obliged to S. Petukhov (Museum of Universe History, Dedovsk city, Moscow region), P. Muromov, R. Wesel, P., M. Burski, M. Farmer, R. Ward, V. Ignatov, P. Zareba, T. Jakubowski, J. Kettunen, J. Kalbe, S. Nesvetaev and anonymous collectors and researchers for submitting find data, ccordinates and in situ photos.